If you're looking for a tasty party dip that's easy to prepare and always a hit with guests, then this refreshing chilled dill dip is for you! Beat cream cheese, dressing and milk in small bowl with electric mixer on medium speed until well blended. Add remaining ingredients; mix well. Cover. Refrigerate several hours or until chilled. 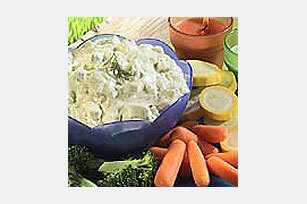 Serve with assorted cut-up vegetables.